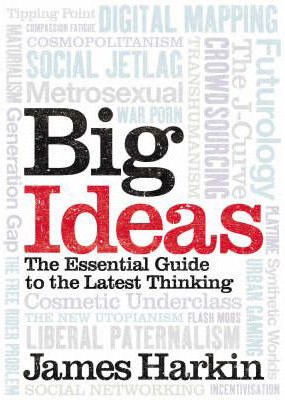 Big Ideas is a book partly based on a column I used to write for the Saturday edition of The Guardian newspaper. It’s a catalogue of seventy-five new ideas – and explains where they came from, what they mean and whether they’re any good. Maturialism: the name given to the new trend among middle-aged people of spending their money on expensive ‘youth’ gadgets and services, and the new habit among advertisers of targeting the mid-life market, repositioning their brands as accessories to the distinctive joys of mid-life. The Tipping Point: the controversial idea that the best way to understand everything from changing fashions to the rise of teenage smoking is to imagine people as viruses and social phenomena as contagious epidemics. Social Jet Lag: an ailment suffered by up to half the population, social jet lag is said to arise when our body clocks falls out of synch with the demands of our environments, thus putting us at risk of chronic fatigue and an increased susceptibility to disease.